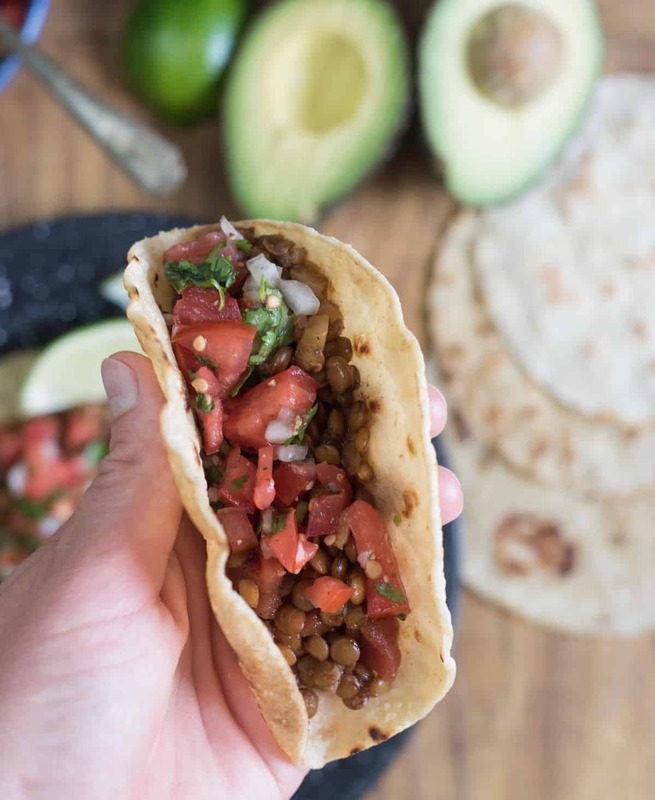 Quick, easy, and healthy lentil tacos are one of our favorite plant-based dinners the whole family loves. Tacos are one of those meals that are always bouncing around the menu plan for a few reasons. They are simple to prepare and make it to the table quickly, you normally have everything on hand to make them, and everyone likes being able to top a taco with what they like best. 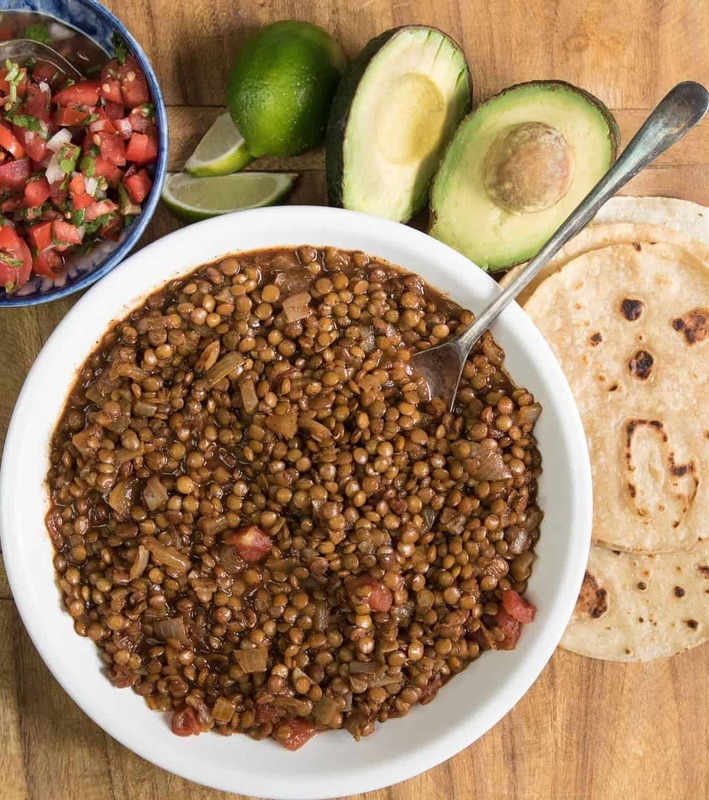 Today’s recipe for lentil tacos is thinking outside the beef box a bit, but with all of the quick/easy/deliciousness that you love about tacos. I’ve been on a quest to feed my family more meatless meals. It’s good for our health, the budget, and the planet. Taking the meat out of tacos might sound like an oxymoron, but I’m here to tell you that when you use the right seasonings, the flavor stays the same. 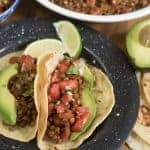 Lentil tacos taste just like “regular” tacos! My kids balked at this meal when I first tried it a few months ago, but once they got past the fact that it was different and actually tried a little, they loved it. Lentil tacos have been in our regular rotation all summer long and they are here to stay. This is a great meal to have up your sleeve when cooking for vegan, vegetarian, dairy-free, and gluten-free friends too. Do a little label reading to make sure the seasonings/salsa/broth fit your dietary restrictions, but all in all it’s a great meal to accommodate all kinds of dietary needs. Did I mention it tastes great, is easy, and is inexpensive too? 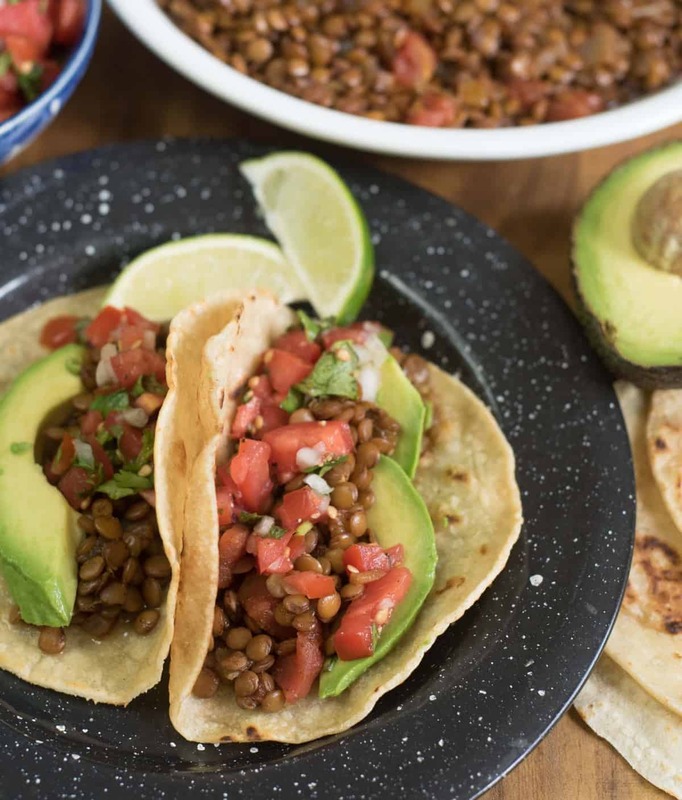 There’s a whole lot to love about these delicious lentil tacos, and I can’t wait for you to try them. The cooking time of your lentils will vary slightly based on how old or dry your lentils are. If the lentils are still too firm after 30 minutes have passed, continue cooking, adding small amounts of water or chicken or veggie broth as needed. You can omit the spices and add a tablespoon or so of taco seasoning to taste if that’s easier for you! Don’t add the salsa until the lentils are done cooking and just before serving. It adds great flavor and texture to this dish. New to lentils? Find them near the dried beans at the grocery store. 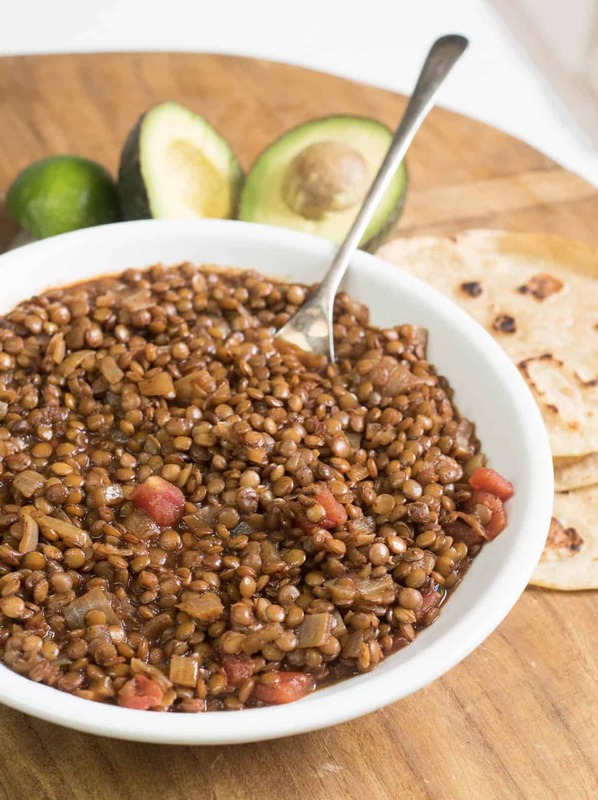 Don’t use red or black lentils for this recipe, though (their texture is different). Look for something like this. Top with what is in season/you have on hand/you love/fits dietary needs. The options are endless. Easy blender salsa, Sante Fe Rice, and tomatillo dressing (recipe from 2010, don’t judge my pictures too harshly, ha!) are all great on lentil tacos. No need to stick with just a taco! Turn this into a burrito, taco salad, tostada, or nachos. taco toppings such as avocado, salsa, hot sauce, lettuce, tomato, onion, black olives, cilantro, cheese, sour cream, etc. In a medium sauce pan, add the oil and heat over medium to medium high heat. Add the onion and cook until the onion starts to soften, about 5 minutes. Add the garlic and cook until fragrant. Add the dry lentils, vegetable or chicken stock, chili powder, salt, cumin, and smoked paprika. Stir to combine. Bring the mixture to a boil and then reduce the heat to medium low. Cover and let it simmer for 25 to 30 minutes until the lentils are tender. Stir in the salsa and serve right away. Serve these in tacos, burritos, taco salad, or any other way you like. The cooking time of your lentils will vary slightly based on how old your lentils are. If the lentils are still too firm after 30 minutes have passed, continue cooking, adding small amounts of water or chicken/veggie broth as needed. Thank you for being here, and enjoy these lentil tacos from my table to yours. Made it many times, it’s a quick easy recipe and a good alternative if you don’t have all the spices to make a “taco seasoning”. Just the three spices work great. What kind of tortillas are those? They look delicious. Did you roast them or fry them or something? They are just white corn tortillas from the grocery store that I cooked in a hot skillet with a little spray of cooking oil on each side. So easy!